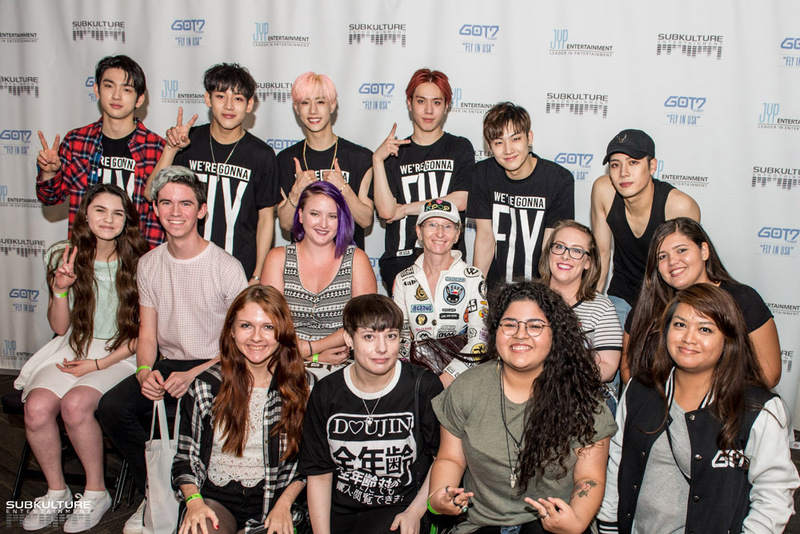 Got7: Fly in the USA Concert Review. On Friday July 1st the Kpop group Got7 held their first concert in the US and their first stop was Dallas, Texas. They had previously held a Fan Meeting here and so it was not their first trip to Dallas, although this time more fans were at the airport to greet them, some even trying to follow them to their hotel. The venue was the Verizon Theatre in Grand Prairie which by now, after hosting over a dozen Kpop concerts, should have better methods in place for dealing with the enthusiastic fans who are a part and parcel of Kpop. The early entry in particular was very poorly handled. Once inside past the absolute chaos of actually getting inside I met some really nice and helpful staff. Although the parking is expensive the traffic flow pattern has improved over time and getting in and out is a little better. The auditorium itself is spacious with the seats set decently apart and with just enough of a rise between rows to allow most people a good view of the stage. There were large screens set up to allow those at the back close up views of the action. The stage itself had minimal sets, unlike JYP’s other group 2pm who had a fairly impressive stage when they performed at this same venue in Nov. of 2014. Most of the audience, however, probably wouldn’t have noticed sets anyway as they were there to see their idols. Got7 is a 7 member boy band, although due to an illness Youngjae was unable to perform. This did lead to some gaps and very slight confusion during the performance but the other group members did a remarkable job covering for their absent friend. Junior in particular seemed to feel the absence of Youngjae and seemed a little nervous too. It seemed to take him a little while to get into the swing of things; that is not to say that he was not performing well, just that he seemed stiff and uncomfortable, like he was not having fun. His smile showed up as the evening progressed and by the end of the evening he looked happy and relaxed and was doing the most fanservice for the crowd. He was particularly cute at the very end when they stood together for a group shot and he hurried to the side of the stage where he had earlier seen a fan with a light up Youngjae sign. He asked to borrow the sign and it was held up in place of Youngjae for the final group photo of the concert. He was so sweet. JB also missed Youngjae particularly as they were scheduled to perform the duet 1:31 together. JB sang alone and did an amazing job of holding everyone’s attention even though he was alone on stage. The crowd supported him wholeheartedly. JB was also super cute during a brief chat session when he was asked about Youngjae not being there on stage with them. He said he was sad, especially because he had a duet with him. JB really did look sad, in a forlorn lost puppy kind of way. The famous JB smile was a little slow in lighting up the stage during the first part of the show, but as he relaxed that captivating smile did appear and he stopped looking like an anxious dad. I’m sure as the leader he had many concerns and I was glad when he began to look like he was really enjoying himself. JB also spoke to the audience with a few words in English, although most times he relied on the translator or one of the members who speak English. Jackson was his usual over the top self and if he was nervous at any point he didn’t show it. He was very caring of his fans, at one point recommending we all drink organic green tea, eat our vegetables and take care of ourselves so that we can be together with Got7 for a very long time. He threw himself into some of the dances with vigor and was impressive to watch. He joked around from time to time and even though the auditorium was freezing he was the first to take his jacket off and we got ample chances to see his toned arms. Mark was cute and smiled a lot and it didn’t take long for him to relax enough to grin and give the side eye to other members on the few minor mistakes they made as they adjusted their choreography to fill in for Youngjae. He was at ease during the chat sessions since he speaks English, and joked around with Jackson and BamBam and the audience. His acrobatic dance moves were on point as was to be expected. It is hard to describe BamBam’s performance except to say that not only did he sing and dance and have fun, he also seemed to be the energy drink that kept everyone ‘up’ and excited. He smiled at his other members as much as he did to the audience, he patted the small of a back or a shoulder when passing during dance moves and generally was encouraging and supportive. He was cute and adorable and all those attributes we love him for. At one point towards the very end BamBam threw a towel out into the audience near me. It was so funny in that he threw it so hard, for it to only land about 3 rows from the stage. Aw BamBam we love you. The MVP for the concert for me had to be Yugyeom. Maybe because he’s the youngest he didn’t have the concerns of his hyungs, or maybe it is just his nature, but he was having a blast and it showed. He put his all into the choreography and it was a joy to watch him dance. His smile was contagious and it even popped out during some of the more serious songs until he corralled it back under control. He tried really hard to speak to the audience in English and you could tell that everyone of those words was from the heart. He was adorable, and young, and full of the joy of life. It was hard to take your eyes off him. Well done Yugyeom, you did well and your hyungs should be proud of you. As a group Got7 performed and put on a first rate concert, they were a little stiff at the beginning but gradually each member began to relax and have fun. They all came together with Home Run and after that everything was completely amazing. They interacted well with the audience, who loved every minute of the concert screaming their hearts out and unceasingly waving their light sticks. Got7 provided their fans with an amazing act of fanservice by appearing and walking through the aisles of the theatre thereby giving so many fans the opportunity to see them up close. Some fans even got to touch their hands. That was a wonderful thing for them to do. Three member passed within 4 feet of me which was exciting. I was fortunate to be one of those who got to have the photo op with the group after the concert and this was the highlight in multiple ways. I was able to speak a few words to JB and thank him for the concert and also when interest was shown in my jacket I exchanged a few words with Jackson. So eye to eye contact and a minimal conversation with two members that should be enough for any fan, right. But it got better when I heard a voice saying, “look at her shirt….um jacket. She has all of them. Where is Got7? Where is Got7?” It was BamBam who had noticed my jacket and wanted to know where the Got7 patch was on my jacket. Eye contact as I turned to show him where the patch was. He also saw my parasol and asked me if it was raining and I replied it was for the sun. He seemed like he wanted to say something else but my time was up and I was ushered out. What an end to the evening. And BamBam, if you ever read this, Got7 is between BigBang and Shinee, so you are in good company. If you were at the concert and would like to share some of your thoughts and experiences please feel free to do so in the comments. ← Reviewing a Korean Movie. Thank you so much for such a great article. I was lucky enough to also attend this concert. It was my most favorite concert I have ever seen. I will for sure go to another GOT7 concert in my future if GOT7 comes back to Dallas. Thanks Tonya, and I too will go see them when they come back to Dallas.